You’re sitting down, minding your own business enjoying a meal when suddenly you feel something shift on your teeth. You come to the startling realization that you’ve just lost the crown on your tooth. Whether it’s from the food you were eating, or the decay of the tooth, crowns can come loose and fall out for a variety of reasons. While it is a somewhat common experience, many people don’t know what to do when they lose a crown. If you’ve lost a crown, don’t worry, your trusted dentist in Eagan is here to help! Just follow these simple steps. Losing a crown can be a jarring experience, but it isn’t a life-threatening one. Usually, crowns come loose and fall out while you’re eating, flossing, or brushing your teeth. If possible, recover the crown, but it’s not uncommon to accidentally swallow the crown. In these cases, just remember that you’ll be fine. You’ll pass the crown without any issue, but you’ll have to have a new crown made instead of simply replacing the existing one. If you’ve found the crown, gently clean it with a toothbrush. Also, take the time to clean your exposed tooth as well. Your tooth may be a little painful, so brush carefully. Once the crown has separated from your tooth, you’ll want to call your dentist as soon as possible. Often, they’ll be able to fit you in as an emergency dental appointment. Until your appointment, you’ll need to take care of your crown and your tooth. If you have recovered the crown, it’s best if you temporarily replace it on your tooth. You can use a variety of products to accomplish this. In a pinch, a daub of toothpaste will do. Dental wax is also a good choice. If available, consider using denture cream. Before you apply any of these, make sure you test fit the crown so you know how it fits properly. With the temporary sealant in place, put the crown back on your tooth. If you have lost the crown, you’ll need to protect the tooth another way. Without the crown, parts of your tooth are now exposed to the risk of developing an infection. Gently brushing the tooth with toothpaste can clear out some debris, but you might consider using some dental wax to cover the tooth until your appointment. 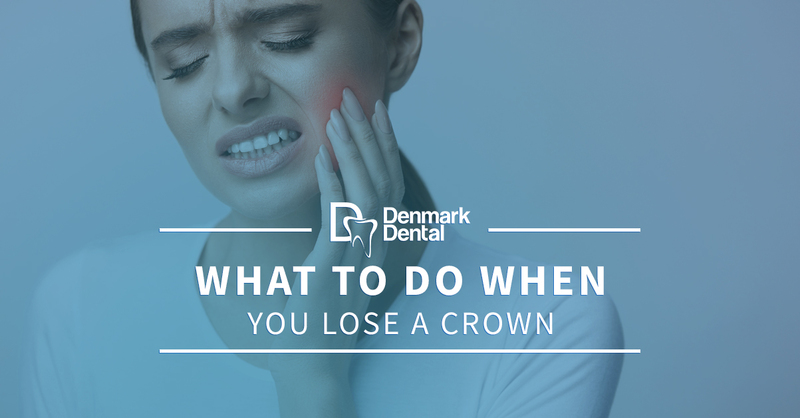 The loss of a crown can be a painful experience. If your tooth feels very tender or sore, consider using clove oil applied by a cotton swab. The oil should help to alleviate most of the pain. If the pain persists, however, use over-the-counter anti-inflammatories. You should meet with your dentist to replace the crown as soon as possible. While covering the tooth or replacing the crown with a sealant works in the short-term, it can lead to long-term complications if not addressed by a specialist. At Denmark Dental in Eagan, we are dental crown experts. We offer a few different crown material options, all meant to fit your budget and needs. We can use metals or porcelain. Our crowns are durable and work to prevent further tooth decay and other oral complications. Are you in need of a permanent or temporary dental crown? Then it’s time to visit our dentistry in Eagan! We’ve been a part of the community for more than 40 years, providing expert care to our friends and neighbors. Book your appointment today!